Along North Florida’s glittering Gulf Coast homeowners will find an array of exquisite communities with enough sun, sand and water to make each and every day an adventure. One such community is Fort Walton Beach, a place where the white sand beaches meet the emerald green waters of the Gulf of Mexico, making it one of the world’s most beautiful spots to call home. Fort Walton Beach is located between Pensacola and Panama City in of the Florida’s most dazzling tourist areas. The city is home to a number of resorts and amenities that entice visitors to come and relax for a few days, but it is the hometown feel of the community that has held the allure for a growing number of homeowners in the area. This laid-back attitude has helped Fort Walton Beach grow to approximately 20,597 residents, according to the U.S. Census Bureau. While many other communities throughout the area boast a non-stop party atmosphere through the busy tourist season, Fort Walton Beach has been known to take it down a notch, making it a quieter and more peaceful community in the region. In downtown Fort Walton Beach, where much of the action of the city takes place, a sense of southern hospitality pervades the many locally-owned boutiques, restaurants and bars. Being so close to the sea and all of the delicious fare that it provides, Fort Walton Beach has access to some of the finest and freshest ingredients for its local cuisine. The heart of the city is in Uptown Station, the town center which features a premier shopping center consisting of national and specialty stores, a park with interactive water features and a fine dining district. Many of the city’s events are held at Uptown Station including family movie nights, beer and wine tastings, various charitable events and so much more. With the heart of the community located in town, the pulse of what drives the community is definitely down by the seaside at Fort Walton’s exquisite beaches. 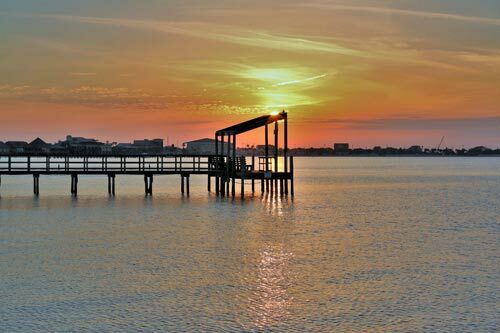 The city features the signature self white sand beaches known to the Emerald Coast, along which residents can find endless activities, including fishing expeditions through charters, surfing, paddle boarding, and good old relaxation. Fort Walton Beach also hosts a number of dockside festivals including the annual Billy Bowlegs Pirate Festival, Dog Daze and the Winter Guest Fest. Being such a busy and vibrant community affords Fort Walton Beach homeowners a wide variety of job opportunities. Two main industries feed the local economy in Fort Walton: tourism and military. The military is an important part of the community throughout this region. Local stations include Eglin Air Force Base and Hurlburt Field. This influence helps instill area residents with national and local pride and friendliness that is unlike any other, making Fort Walton Beach a wonderful place to call home.